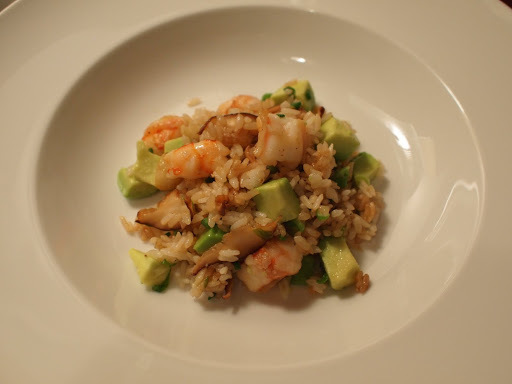 I love the combination of shrimp and avocado and I came up with the idea of avocado fried rice. The flavor profile is not like Chinese/Cantonese fried rice because it includes lime juice and shiitake and uses short grain rice, but I see the avocado as a substitute for egg, which is typically used in fried rice. The richness and creaminess of avocado reminds me of egg yolks (especially when they are cooked). 1. Cut the avocados into medium sized cubes (1/4 inch) and dress with the lime juice and salt in a medium bowl. Cover with plastic and set aside in room temperature. 2. Cut the shrimp into thirds and season with salt in a medium bowl. 3. Thinly slice the garlic cloves and shiitake mushrooms (1/8 inch). 4. Heat the canola oil in a large sauté pan or wok over medium heat (it will be better to cook this recipe in batches of 4 servings or so if no big wok is available for use). 5. Immediately add the sliced garlic and when fragrant, add the shrimp (the pan should be hot at this point). 6. Saute the shrimp with the garlic and when the surface of the shrimp is cooked, add the shiitake mushrooms and turn the heat up to medium-high. 7. Keep sautéing but be careful not to burn the garlic. When the shiitake mushrooms have wilted, add the lime juice. 8. Once the shrimp has cooked through, add the rice and try to separate the grains with chopsticks or a wooden spoon without crushing them. 9. Stir fry the rice and add the butter and soy sauce (make sure the soy sauce incorporates fully and evenly). 11. Take off the heat and fold in the scallion and avocado.